PROsport Performance will make a third trip to the Liqui-Moly Bathurst 12 Hour this February, confirming their squad to defend their GT4 victory scored in the race last year. The German team – based in Weisemsched, near the Nurburgring – has confirmed Jörg Viebahn (Germany), Max Braams (Netherlands) Marco Schelp (currently New Zealand) will drive their Porsche Cayman PRO4 entry this year, with the potential to add a fourth driver. “We are optimistic about our third appearance in Australia,” said Team Manager Chris Esser. With nearly 16,500 kilometers to travel, the team has one of the longest journeys of the participating in the race this year. The team from the Eifel – that has existed since the beginning of the 1980s and initially mostly raced on the legendary Nürburgring Nordschleife – developed the dream of a motorsport adventure in Down Under early in the piece. “We started in 1986 at the Grand Prix of Touring Cars at the Nürburgring,” Esser explained. But it took nearly 30 years to implement the idea. 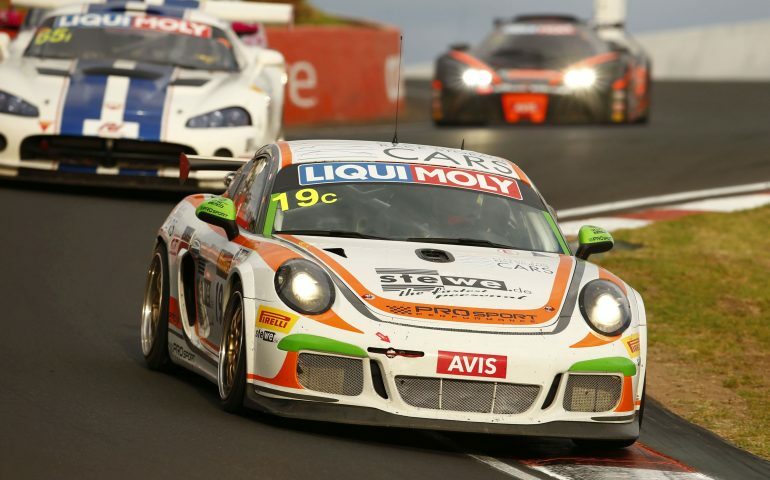 PROsport Performance has been successful in the GT4 European Championship since 2013 when the team won the European Championship drivers’ title in a Porsche 997 GT4. In 2016, PROsport Performance was twice as successful: With the in-house development Cayman PR04, the European Championship titles were won both by the drivers and in the team classification. The team made their first trip to Bathurst in 2016. Behind the wheel, the Germans Florian Hamprecht and Jörg Viebahn alternated with the British Adam Christodoulou and the Belgian Nico Verdonck. “Unfortunately, the race did not go as we had imagined – but the trip to Australia was well worth it, anyway,” said Esser, after the team was forced out of the race after four hours due to an accident. The weekend had already been a challenge – prior to qualifying, new software for the transmission was supposed to be installed. However, following that, the on-board computer collapsed. Rather than taking to the circuit for practice, the Porsche was transported to Sydney to be resuscitated in an emergency operation. Thanks to a data transfer from Stuttgart, the Cayman ran again, albeit with less power. The story of the race, which started from the last place on the grid, is briefly told. Verdonck quickly made it into the top 30 with an early double stint. Subsequently, Hamprecht continued the advance and at the time of the failure, after four hours, the Porsche was already in 20th place in the overall standings and second in the class. However, on the 92nd lap Hamprecht skidded backwards into the wall in the final bend. A year later, PROsport performance traveled towards Bathurst with two Porsche Cayman PRO4 entries. In the end there were almost only happy faces. Jörg Viebahn (Germany), Max Braams (Netherlands), Nicolaj Møller Madsen (Denmark) and Harrison Jones (Australia) won the GT4 class took a strong 23rd place in the overall standings. PROsport Performance performed well throughout the race weekend. The Cayman were among the fastest in the class for all training sessions, even though there were problems just before qualifying. After the fuel tank system in the garage had to be repaired, the Porsche were fueled too late before qualifying. The lap times were therefore deleted. Viebahn / Braams / Møller Madsen / Jones had to start the race from last place on the grid, but quickly fought their way forward in the class. Then there was a tough but fair duel with a KTM X-Bow GT4 throughout the race with the pair swapping the lead on several occasions. Only when the KTM stopped two hours before the end with technical problems, the PROsport Cayman could push on to the finish, ultimately finishing three laps ahead of the rest of the competition. The second Porsche Cayman PRO4 of Charles Putman, Charles Espenlaub, Joe Foster and Andy Pilgrim (all USA) also showed a good performance, though only until qualifying. In free practice, the quartet was able to keep up with the times of the competition. After a crash in qualifying, the Cayman was withdrawn for safety reasons. “Being the reigning GT4 European Champion, winning here in the international competition is very important to us,” Esser said.